To ensure work zone safety, a traffic control company requires depth. It isn’t enough to drop a few cones and position a couple of flaggers. A wide range of services come into play. 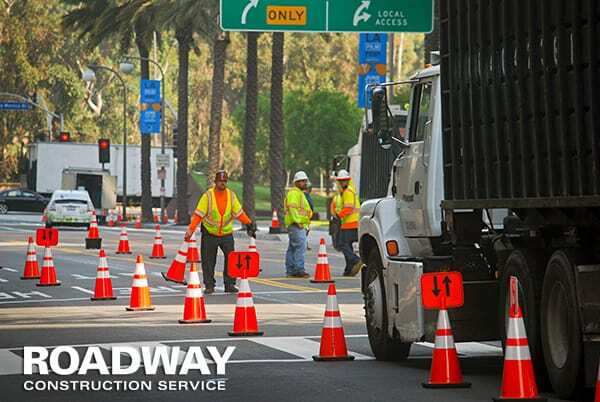 Roadway Construction Service is a full-service California traffic control company that meets these stringent requirements. We cover the waterfront, providing everything from expert pre-planning and permitting to full deployment of devices and crews. Of all the factors contributing to work zone safety, lane closure is among the most important. But there are steps to be taken. Before Roadway Construction Service shuts down any lane, appropriate permits must be secured. If you’ve ever pondered in a moment of meditation: “Is it legal to close a lane on a public street without a permit?” NO! is the inarguable answer. You don’t just slam the door on all those cars, trucks, and SUVs. Authorization is mandatory. Period. To meet this requirement, RCS has developed premier lane closure planning and permitting services. So, what is the proper lane closure procedure? Roadway Construction Service kicks off the process by tackling the encroachment issue. Basically, encroachment is any interference with or obstruction of a public right of way road. These include towers, poles, fences, or other structure impeding traffic flow. Municipalities allow encroachments in work zones – but only after an encroachment permit is obtained. This doesn’t happen in a snap. Encroachment permits for lane closure are awarded only after a lengthy process. Those seeking authorization must submit a Standard Encroachment Permit Application (TR-0100) to the District Encroachment Permits Office. Details galore must be covered. Required supplements to the application include plans, insurance documentation, and other supporting materials. Naturally, certain charges accrue. So, along with supporting documentation, applicable fee payments must accompany applications. The cost is variable, depending on encroachment type and processing time. Rest assured, decisions don’t arrive overnight. Approvals or denials can take up to 60 days. Because RCS thoroughly covers all the bases with expert encroachment planning, we consistently earn those all-important approvals. We don’t like starting over. Neither do our clients. There are, of course, many other variables RCS considers for the traffic control plan. For instance, the issue of road barriers for lane closure. Depending on project scope and work zone conditions, our team may deploy any number of barricades. Possibilities range from Jersey Barriers (K-rail) to reflective cones. As with all other components of a temporary traffic plan, these protective devices contribute immensely to work zone safety. Equally important are traffic flaggers for lane closure. We hand pick our flagger squads, making sure they fit the job to a tee. But no matter which flagger team gets the mission, they’ll be extremely qualified. Not only are they expert communicators, they’re master protectors of work zone safety. That’s because every one of our flaggers is supremely qualified by top-flight credentials, including OSHA certification. Clearly, work zone safety is top priority at Roadway Construction Services. From lane closure planning to flagger deployment, our full-service solutions contribute substantially to a well-protected environment — without compromising efficiency. To learn more, contact Roadway Construction Service for additional information about our industry-leading solutions and competitive rates.